I get an error box all the time. Hiya. I just got Woofy and was eager to start it up and see how well it works. …every time I try to click ANYTHING (even when I minimize/restore/maximize, if you can believe it). I'm on WinXP SP3 (32-bit, I believe), I was running .NET Framework 2, then I upgraded to 4 to try and fix this, and I still get this dialog box on every click of a button and can't do anything with Woofy. I'm not sure why this happens - I think it's because the definitions got messed up somehow. Could you try out the 1.0 Alpha version and see if it also crashes? Just got 1.0 Alpha…tried to open it…annnnnnnnd, it doesn't even open. I get the Windows-standard "send error report" dialog box, and since it won't be sending the report to YOU, I see no reason to click "send". I'll post a screen cap of "what's included in this error report" when I get to a faster connection. Sorry, dude—bottom line, Woofy doesn't work for me (I wasn't even using extra definitions in the other release). Sorry to hear it doesn't work for you - I have XP SP3 at home too, and this hasn't happened to me, so I assume it has something to do with your specific settings. 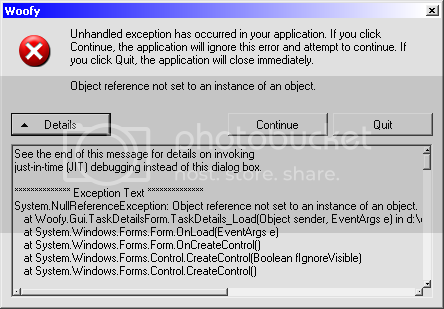 If you're still interested in trying to debug this, the Event Viewer error log would be more helpful than a screenshot - just type eventvwr.msc in the Start->Run box, look in the Application category for any errors from Woofy and paste the full details here. EventType clr20r3, P1 woofy.exe, P2 1.0.0.362, P3 4cf15cf2, P4 autofac, P5 2.2.4.900, P6 4bff9eec, P7 2a4, P8 0, P9 system.typeinitialization, P10 NIL. Woofy 1.0 requires at least .NET 3.5 . From the error message, it looks like you only have .NET 2.0 installed (Woofy's internal error reporting is not even initialized, the Event Source is .NET 2.0, the information is garbled, etc). I've attached a simple application compiled with .NET 4.0 - it should work if you have the proper .NET framework version, and fail otherwise - you can download it here. Something I think is worth noting is that when I tried to run the new Woofy from program files it wouldn't work even though I had the proper .NET installed. In after thought all I probably had to do was give it admin privileges but oh well. I just run it from the desktop now. Yes, but you're probably using Windows 7/Vista, right? Metalitia is using XP. The Net4WinTest.exe seems to be running (it's in my Task Manager, and didn't simply fail), and it takes 32MB of RAM. Is it supposed to do something besides be there? It doesn't show up on my taskbar or anything. If all it's supposed to do is be there…then I guess it worked? That should mean Woofy should be able to run, right? I was double-clicking the icon directly in its folder, but if there's a different way I should be starting it up, I'd like to know so I could try to do it right. Where do I troubleshoot my .NET anyway so I can get my Framework 4 recognized instead of my Framework 2? I find it pretty weird, actually - it shouldn't run at all if you don't have .net 4, but in your case it runs without displaying anything. I'm guessing your system got corrupted somehow - you might try reinstalling .net 4, but I don't think that's the actual issue - try running a virus scan.